1. What is the mission of RWCI? The mission of RWCI is to promote a collaborative community centered on quality housing, education, health, wellness and opportunity. 2. What are the agency’s goals? The ultimate goal of the initiative is to contribute to economic revitalization on West Boulevard. To achieve this vision, RWCI will: 1) develop and implement a high-quality cradle-to-career educational continuum that includes a child development center and a pre-K – 8 school; 2) ensure children and families have access to wraparound services that meet their unique needs related to health, mental well-being, job training, parent support, education, and social services; and 3) support the development of mixed-income housing that serves our targeted geographic area. 3. Why was RWCI created? 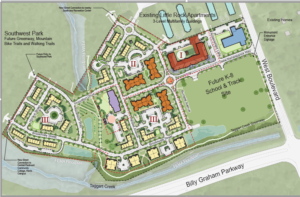 In 2009, the Charlotte Housing Authority received a $20.9 million HOPE VI grant to revitalize the Boulevard Homes as a mixed-income community that included plans for an education village and supportive services for families. RWCI was launched to lead the implementation of the education and services continuum. 4. What is the total investment in the community? When completed, The Renaissance will be a $90M community that includes investments from HUD, Charlotte Housing Authority, Charlotte-Mecklenburg Schools, the City of Charlotte, tax credits, bank financing, and philanthropy. 5. Is this effort based on a successful model? Yes, Renaissance West Community Initiative became a member of the Purpose Built Communities network in March 2013, joining a growing national movement to break the intergenerational cycle of urban poverty through holistic community revitalization. 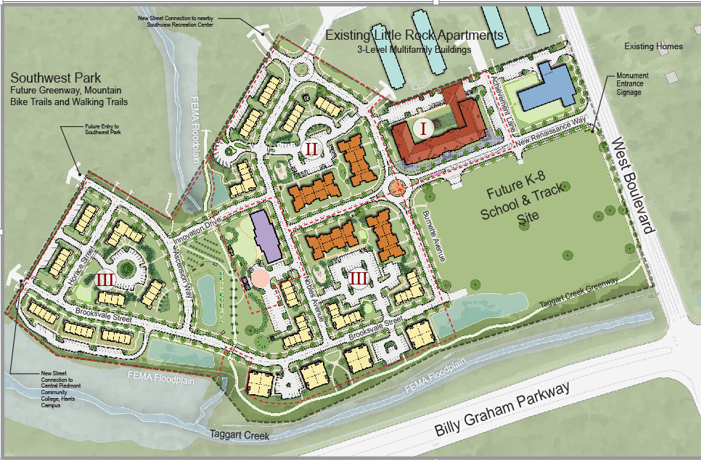 The initiative, based on the success at East Lake in Atlanta developed by Purpose Built Communities, is a comprehensive approach that includes mixed-income housing, a high quality child development center, a K-8 school, and wraparound services for children and families. Similar to Boulevard Homes, the Villages of East Lake was once enmeshed in poverty and violent crime. In 1995, community leaders set out to rebuild and renew the neighborhood. Affordable and market-rate housing was built, as was the Drew Charter School, which became a cornerstone for the redevelopment. Today, the East Lake Community is thriving with 2,100 mixed-income residents in high-quality housing, increased employment, violent crime cut by 95%, and a school that has gone from the worst in Atlanta to one of the best in the city and the state. Students in the Charles R. Drew Charter School outperform city and state averages, and in 2012, 99% of students in grades 3–8 met or exceeded state standards in reading and language arts, and 98% in math. The dynamic growth of East Lake has also attracted more than $175 million in new residential and commercial investment in the surrounding area, and boosted home values 3.8 times relative to those elsewhere in the City of Atlanta. 6. Where is the area that is impacted by RWCI? The Renaissance is located in West Charlotte on West Boulevard, just east of Billy Graham Parkway. The Renaissance is only minutes away from Interstate 85, Interstate 77, Uptown and located on a bus route. However, the initiative hopes to make an impact larger than just the physical footprint of the redevelopment site. The education and community programs planned will create opportunity for neighbors to engage in a broader community revitalization. 7. How many units of housing are at The Renaissance? The Renaissance includes 334 units of mixed-income housing. This includes 110 apartments for seniors (age 65+) and 224 units of family housing. Two-thirds of the housing will be for families that earns up to 60% of area median income. One-third of the housing will be for market-rate tenants. 8. What does the ‘cradle-to-career’ educational continuum include? The Howard Levine Child Development Center (HLCDC) and Renaissance West STEAM Academy (RWSA), a CMS pre-K – 8 school, will be located on site. RWSA has opened for the 2017-2018 school year, followed by the HLCDC in the winter of 2017. In addition, adult learning opportunities are being offered. 9. Why is early childhood education important? 10. What outcomes does RWCI expect? RWCI and CMS have entered into an innovative public-private partnership to maximize the opportunity for student success for the children who live at The Renaissance and within the surrounding area. This community school model is jointly led by a School Leadership Council comprised of RWCI representatives, CMS leadership, community members, and the school principal. CMS is using voter-approved bond funding to build RWSA in The Renaissance community that opened in August 2017. The school serves as the centerpiece of the community and integrates wraparound services, such as health care and academic enrichment programs, into the academic model. As a community school, the facility will provide additional services, programs, and community activities. The education program will be grounded in the success of The Drew School in Atlanta and include a STEAM theme with a strong literacy focus. The principal of the school, Erin Barksdale, spent the 2016-2017 school year participating in a fellowship training program at the Drew School in Atlanta, GA.
11. Why are wraparound services important? The Wraparound model of service delivery is comprehensive, and addresses all life domains across home, school, and community. Wraparound services are designed to be flexible and unconditional: children and families don’t fail but plans sometimes do. Wraparound is based on the belief that services and supports should meet the unique needs of students and their families and be driven by the plan the family created. Wraparound is a strengths-based, family-driven model that is designed to meet the needs of both student and families in home, school, and community settings. 12. How is RWCI funded? RWCI has completed a Comprehensive Campaign to raise additional capital and operating dollars. 13. Does RWCI have community partners? Yes, our partners include the Charlotte Housing Authority, Charlotte-Mecklenburg Schools, YMCA of Greater Charlotte, The Charlotte-Mecklenburg Public Library, UNC-Charlotte Center for Urban Education, Discovery Place, and Mecklenburg County Park and Recreation. 14. What outcomes does RWCI expect? RWCI will engage in rigorous evaluation to determine the impact of the initiative. Outcomes are expected to include measures of school readiness, academic achievement, housing stability, and effectiveness of wraparound services. 15. Where can I find the Form 990 for RWCI? The 990 form can be found HERE. 16. Where is the Private Policy? The Private Policy can be found HERE.